Take the?guesswork?out of your nail stamping and hit your desired spot on your manicure more efficiently!? This set gives you: (1) 0.9mm and(1) 0.6mm clear replacement heads specifically for our mini,?Dual Sided Glass Stamper? (No Handle included).? 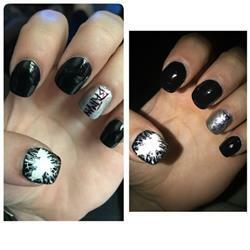 Not only do these stamper heads allow you to hit your desired location every time on your nails,? but now you can work on several designs at one time.? *TAKE SPECIAL CARE*:? These stamper heads take a lot of love to create, make sure to continue that love with these helpful care tips: 1) Do not prime the clear head.? Sanding will cause haziness.? 2) Use a lint roller or scotch?tape?to remove polish from stamping heads.? Using 100% acetone and other nail polish removers may cause the head to look cloudy. 3) Do not over squeeze or pinch the stamping heads, it may cause the heads to tear. FOR MINI GLASS STAMPER ONLY. This set has (1) 0.9mm and (1) 0.6mm stamping heads. I’ve never had a problem with BMC stampers or plates. They always turn out perfectly. So far I’m enjoying the plate dividers and I haven’t used the acrylic brushes yet but they look decent! Definitely recommend anyone who loves doing their nails to try their stamping sets!! I accidentally got acetone on the head of my stamper. These came quickly and fit perfectly. Thank you!